"These are serious statements attesting to radicalization," says Public Security Minister of calls to kidnap soldiers during protest. 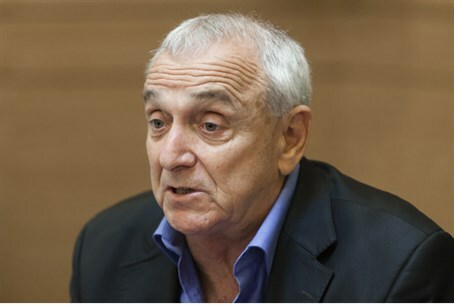 In the wake of the violent clashes that broke out during a protest by Israeli Arabs in north-central Israel, Public Security Minister Yitzhak Aharonovitch (Yisrael Beytenu) warned on Friday evening that there has been a radicalization among the Israeli Arab public. “These are serious statements attesting to radicalization," said Aharonovitch, after the protesters who gathered in Wadi Ara called for the kidnapping of soldiers. He stressed that the instigators will be treated to the full extent of the law and added, “We will not allow such incidents to harm daily life." In the violent protest on Friday afternoon, the demonstrators waved Palestine Liberation Organization (PLO) flags and blocked roads. Police officers who tried to disperse the demonstrators used tear gas, and the protesters responded by throwing rocks at the officers. Two officers were among five people injured. At least one protester was arrested. Among those participating in the protest was MK Mohammed Barakeh of the far left Communist Hadash party. "This demonstration is against the violence of the IDF and against the illegal arrests and illegal activities of the IDF in the territories," he declared. Friday’s violence follows remarks by MK Ahmed Tibi, a Deputy Knesset Speaker, who said on Friday that Hamas is not a terror organization, 15 days after two Hamas terrorists kidnapped three Israeli teenagers and in the midst of a rain of rocket fire on Israel from the Hamas-enclave Gaza.